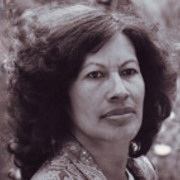 Merata Mita is a key figure in the story of Māori filmmaking. Through documentaries, interviews and her only dramatic feature Mauri, she was a passionate voice for Māori, and an advocate for social change. Merata Mita grew up in the Bay of Plenty town of Maketu, the third eldest of nine children. She had a traditional rural Māori upbringing, and recalls watching newsreels that were projected onto the walls of the local wharenui. Later, during eight years teaching at Kawerau College, she began using film and video to reach high school students, who were "mostly Māori, mostly condemned to failure". As Mita told Mana magazine, "what they were all good at was expressing themselves through art, image, drawing". The experience taught Mita "how powerful image was in reaching people who don't have other communication skills". Mita worked on her first documentary in 1977, helping a Pākehā filmmaker organize interviews with Māori. The same year she made her screen debut, talking about life as a Māori solo mother in TV series Women. She was already growing disenchanted about Māori misrepresentation on film, and the way Māori crew seemed to be employed "merely to make access to the maraes easier". Activist organisation Ngā Tamatoa was a strong influence. Ngā Tamatoa "was intertribal, urban, political. It also gave Māori women a place to speak, a place we didn't have on the marae". In May 1978 Mita took an urgent call: "get a film crew up to Bastion Point". Mita and her co-directors, Leon Narbey and her then partner Gerd Pohlmann, arrived in time to film police removing protestors from the site. Mita talks about the film Bastion Point: Day 507, and how she was impacted by what she saw, in this Kete Aronui interview. Mita also co-directed films with Pohlmann about the trade union movement (The Hammer and the Anvil) and Hokianga's Catholic Māori community (Karanga, Hokianga ki o Tamariki). The pair spent over two years chronicling the Mangere Bridge industrial dispute, for The Bridge (1982). Mita also collaborated with Martyn Sanderson on Keskidee Aroha, which documented interactions between Māori and a touring black theatre group from London. In 1980 Mita began an "often bitter and demoralising" period researching and reporting for Māori news show Koha. After becoming the show's presenter, she spoke about how her Arawa tribe didn't allow women speaking rights on the marae, but that feminism had made some tribe members more open to changes "concerning the position of women, and they accepted that this could be done through the medium of TV". But she was disappointed that Koha was aimed at a majority — ie white — audience, and that the show's te reo content was limited to two per cent. Patu! was Merata Mita's passionate record of clashes between protestors and police during the 1981 Springbok tour. It marked Aotearoa's first feature-length documentary directed by a woman. Police sought court orders to get hold of footage, to help them prosecute protestors; Mita hid footage, and complained of police harassment during the editing process. The subject of intense media coverage, Patu! was described by reviewer Peter Wells as "the hottest documentary ever made in New Zealand". Yet local cinema chains weren't interested (at this time documentaries rarely played in Kiwi cinemas, outside of film festivals). Patu! was invited to film festivals around the globe. In 2012 it became one of the first documentaries listed on the New Zealand section of UNESCO's Memory of the World project. Mita argued that Patu! saw her branded unfairly as a political filmmaker, when in reality the film was primarily visual, and deliberately low on commentary or heavy analysis. Next came Mauri (1988), only the second dramatic feature to have a Māori woman director. It was the first to be directed by a Māori woman solo (1972's To Love a Māori had been co-directed by Ramai Hayward, and husband Rudall). Mauri centres on issues of birthright and racism in a rural community. Land rights activist Eva Rickard and Utu's Anzac Wallace feature. The heart of the story, said Mita, was the characters' relationship with the land. This behind the scenes visit by Koha gave little indication of a sometimes tense shoot. Mita told The Auckland Star that Pākehā crew members tried to "cut all the marae scenes", and complained about less experienced Māori crew. Filming was "littered with people who were obstructive, racist, arrogant and of little or no use to the production. In fact, when we booted the whole lot out things went a lot better. We saved so much money." Mauri won a prize at Italy's Rimini Film Festival. When the film got some negative reviews after festival screenings back home, Mita spoke of Pākehā reviewers who were "not qualified to assess it". She asked not that people liked Mauri, but that they view it with an open mind. Mita said she had consciously rejected Pākehā traditions of storytelling and embraced a layered approach, in keeping with the strongly oral traditions of Māori. She told writer Cushla Parekowhai: "These are differences that Pākehā critics don't even take into account when they're analyzing the film." In 1989 Mita and longtime editor Annie Collins were at an editing bench on Turangawaewae Marae. Mita had accepted a challenge from Film Archive founder Jonathan Dennis: to make Mana Waka, a documentary from abandoned footage capturing the creation of four special wakas, which Princess Te Puea had commissioned for New Zealand's centenary in 1940. At one point descendants of the original Pākehā cameraman ran off with an early print of the film, despite having agreed to let Mita direct. Mana Waka rescreened at the 2011 NZ International Film Festival. Mita also made this documentary on artist Ralph Hotere (2001), and others on rastafarians in Ruatoria (The Dread, 1996) and judicial injustice (The Shooting of Dominick Kaiwhata, 1993). Her video for Che Fu hit 'Waka' was judged Music Video of the Year at the 1999 Hawaii Music Awards. From the early 1990s, Mita lived increasingly in the United States, alongside then partner, director Geoff Murphy. Earlier she had acted in Murphy's 1983 'Maori Western' Utu, and suggested that unionist Anzac Wallace had the talent to play the starring role (Mita had worked with him on a TV adaptation of Rowley Habib's The Protesters). Mita helped produce Murphy's movie Spooked (2004) and Taika Waititi hit Boy; she also produced 2010 short Taku Rākau e.
Mita set up and led the indigenous filmmaking programme at the University of Hawai'i Mānoa. She became an assistant professor there, teaching indigenous screenwriting, aesthetics and production. Mita hosted workshops and spoke on panels about indigenous filmmaking in many countries, and in 2005 was a key player in the launch of Hawaiian indigenous peoples' festival, the Hawai'inuiakea Native Film Showcase. In 2004 she executive produced The Land has Eyes, for director Vilsoni Hereniko, the first feature directed by a native Fijian. In 1996 Mita was awarded the Leo Dratfield Lifetime Achievement Award for documentary, by the Robert Flaherty Foundation. Two years later she was the subject of Hinewehi Mohi's documentary Merata Mita - Making Waves, made for TV series Rangatira. In 2009 Te Waka Toi gave her the Te Tohu Toi Ke/Making a Difference Award. In the following year's New Year's Honours she received a Companion of the NZ Order of Merit, for her services to film. Alongside Tainui Stephens and fellow Māori film pioneer Barry Barclay, Mita helped brainstorm the idea of an initiative to encourage Māori film and filmmakers. Te Paepae Ataata trust was born in 2010. Mita collapsed suddenly outside an Auckland television studio on 31 May of that year. Her long cherished dream of adapting Patricia Grace novel Cousins into a feature film remained unfulfilled. Mita's film Saving Grace - Te Whakarauora Tangata had originally been set to screen on Māori Television, as part of a Matariki special. Mita described the documentary (which examined how Māori could find ways to prevent violence against children) as one of her most important. Saving Grace finally aired in March 2011. In July 2018, Mita's son Hepi Mita completed a documentary about his mother, Merata: How Mum Decolonised the Screen. The film archivist used footage of his mother and interviews with siblings to direct his first feature, which debuted at the 2018 NZ International Film Festival. Chapters by, or about, Merata Mita and her work feature in books Head and Shoulders (1986), Film in Aotearoa New Zealand (1992), Girls' Own Stories: Australian and New Zealand Women's Films (1997), Interpreting the Past: New Zealand Cinema (2001) and New Zealand Filmmakers (2007). Moe mai e te rangatira, moe mai.